MONO EDITION ON 180-GRAM VINYL. 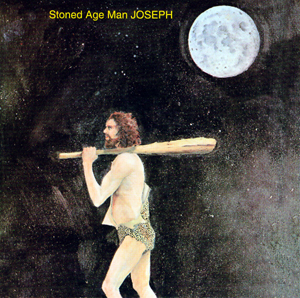 Rooted in the steamy backroads of Texas and deep-fried at a Memphis recording studio, Joseph's 'Stoned Age Man' was served up like a sizzling hot rattlesnake appetizer slathered in fuzz-blooz grease in 1969. Legend has it that the titles of eight of the album's nine songs came before they were written on the spot, which speaks volumes for the talents of Joseph (a.k.a. Joseph Longeria), whom A&R man Steve Tyrell signed to Scepter Records after witnessing the Lone Star State bluesman gig with B.B. King and T-Bone Burnett. Brandishing his guitar like a Cro-Magnons club, Joseph mixes his fuzzy licks with meat-grinder vocals as he loudly ruminates of fattened snakes, fish heads, mountains, cavemen and gumbo in the maddest peyote hallucination Alley Oop never had. Long revered among collectors, this fine slab of rock gets its first-ever reissue from the original masters. This one will rip your turntable from its hinges!